This 150W Sunshine Flexible Solar Caravan Motorhome & Boat Kit offers outstanding performance and great value for money. 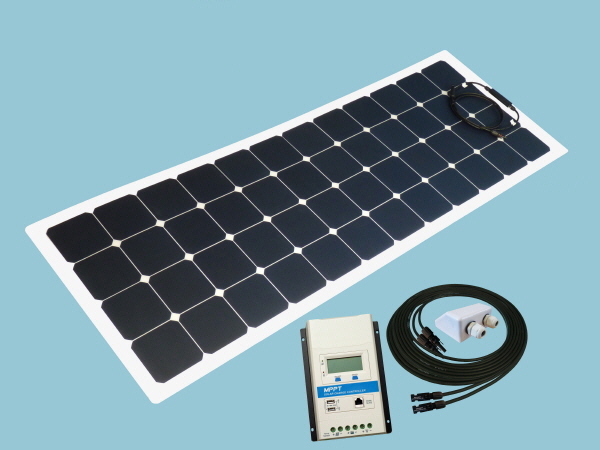 With this 150 Watt solar power kit you could expect to generate around 50 amps per day during the summer months supplementing the 12V leisure battery power in boats etc. The Sunshine Flexible Solar range benefit from being thin, light and unbreakable. Light weight design combined with high efficiency cells and a 20°- 30° solar panel flexibility makes our flexible solar range perfect for marine, caravan and motorhome applications. Save Money..... Don't forget to add Bostik-360 Fixing Adhesive at a reduced price for bonding the solar panel and cable entry cover.